What Is The Cost for Teeth Implants? You have a missing tooth and you are considering replacing it with an implant however you ask yourself how much is the cost for teeth implants ? Dental implants have been in use for several years and were first pioneered and documented by Professor Branemark in Sweden. The first designs of dental implants were very different from what dentists are using today. Generally some shapes are still used today, however many advancements have been made in the technology of dental implant surface treatments. The cost for teeth implants is sometimes considered to be high as this is actually a new form of dentistry being offered today. Like all new technology its not totally mainstream yet. Just like other new developments the initial stages are still pricier and once competition begins to grow, its likely that the cost for teeth implants will gradually come down. 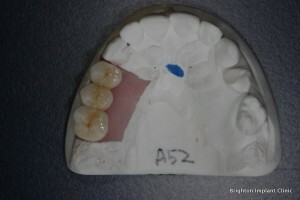 Another area where many improvements have been seen are in the shape and architecture of the dental implant platform. Dental implants have a very wide variety of shapes, lengths, widths and designs. Newer types of dental implants made of zirconia are also becoming popular however the long term success or survival rates are still unknown for certain. The idea of zirconia dental implants is an attractive one since the dental implant is made of a white material and this blends in well in the mouth as opposed to grey titanium. The average cost for teeth implants in the UK is around £1500-£2000 per tooth. The cost for teeth implants should include everything i.e. the dental implant, the permanent abutment and the final porcelain crown. Many practices advertise very low cost for teeth implants however when one analyses closely its a bit misleading. Some advertise just the price of the implant and the price of the crown or abutment is not included. Dental implants are the most predictable and sure way of replacing damaged or missing teeth. Dental implants can last 15-20 years depending on the bone loss around the implant. Generalised bone loss which occurs as a result of gum disease can also result in the lifespan of a dental implant being reduce. At Brighton Implant Clinic our cost for teeth implants is £995 which includes the dental implant, a permanent abutment and the final porcelain crown. For more information please visit our Dental Implants Price List or feel free to Contact Brighton Implant Clinic . Hi Karen, thank you for your enquiry. An allergy to titanium is extremely rare, however if this is something which you are concerned about we would advise that you see your local GP to look into allergy testing. Metal free dental implants made of Zirconia are an alternative to titanium implants. Unfortunately we do not offer this option at the Brighton Implant Clinic, if you would like any further information please do not hesitate to contact the clinic. You fitted an implant for me 2 years ago, and at the time I was under the impression that provided I maintained good oral hygiene the implant lasted for life. However reading the above you say 15 – 20 years? What happens after that time, do I need to go down the denture route or can I renew the existing implant? Hi Graham, thank you for your enquiry. As long as you maintain good oral hygiene, brushing and flossing daily with an annual check up and cleaning with the dentist then your implant should not fail. The 15-20 years mentioned in this article is to be used as a guideline, however each individual case will vary depending on the volume of bone in the jaw and general oral health. 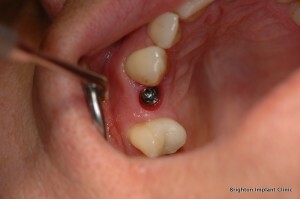 If for any reason your implant were to fail then in most cases a new implant can be placed. If you would like to organise an appointment for a review of treatment please do contact the clinic and we will be happy to help. This article in patient support might also be of some help. I am waiting for a letter from the hospital as i have to have a tooth extracted on the left side of my mouth and a wisdom tooth. 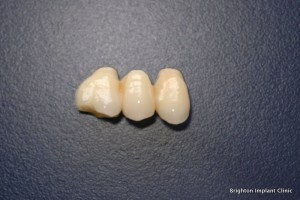 I am not worried about the wisdom tooth but I would like to have an implant on the side of my mouth . I have a tooth missing in front of the tooth that is to be removed. Please can you send me a brochure. I see from the price guide that it would be £995 for each dental implant. Can you also let me know what days you are open and the times. Thank you. We are open 6 days per week, please click this link for our opening hours If you need any further information please feel free to contact us. Does the initial free assessment include an xray of the bone type & condition? Does the £995 figure fall with the more implants needed? Thanks for your comment/inquiry. The initial implant assessment does include a panoramic radiograph if this is needed during the assessment. This radiograph shows the general condition of the upper and lower teeth, a general perspective of bone height and width between teeth. However this is only a two dimensional image and therefore cant provide any detail about bone thickenss. Please note that in order for a dental implant to be placed we do need to be 100% certain of the volume of bone where dental implants are to be placed. This may mean ensuring that there is sufficient bone to safely place an implant above or close to a dental nerve or tooth root. The only way to assess the bone precisely before implant placement is to take a CT Scan. This scan costs £95 and is not included within the free implant assessment. If more dental implants are needed the costs can be lower, for example if 2 dental implants are supporting a 3 unit dental implant bridge. This means that not all teeth that are replaced need to be supported by a dental implant. The overall cost of each tooth replaced is therefore lower. I have only three teeth on my uppers sporadicly placed. Can implants be placed around them and could you give me an idea of the cost for this many please?